Textured vegetable protein, available as a powder or in small chunks or flakes, is made from soy flour containing 50% soy protein. 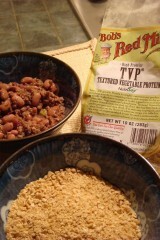 To rehydrate TVP, simply simmer the textured vegetable protein in warm water for 5 minutes (depending on your portion). If you have small flakes or granule-sized TVP, you will want to rehydrate it with 1 1/2 times its weight in warm water. If it is in chucks, rehydrate it with 2 1/2 times its weight. Depending on how much water you add, you can change the texture of the finished product. Adding a small amount of lemon juice, vinegar, or ketchup will speed up the rehydration process. Adding a bouillon cube can even add extra flavor. You must refrigerate any leftover rehydrated TVP. For backpacking, this is much easier than the process of carrying meat and risking it going bad. An average serving of textured vegetable protein contains only 5 grams of vegetable fat, which is healthier than animal fat. The soy beans also provide protein, fiber, vitamins, and calcium. It is also low in fat and cholesterol and has few calories. Many TVP products don’t even contain MSG. Because of the nutritional value, it is a great option to bring while backpacking when you need as much nutrition as possible with as little weight and space as possible. 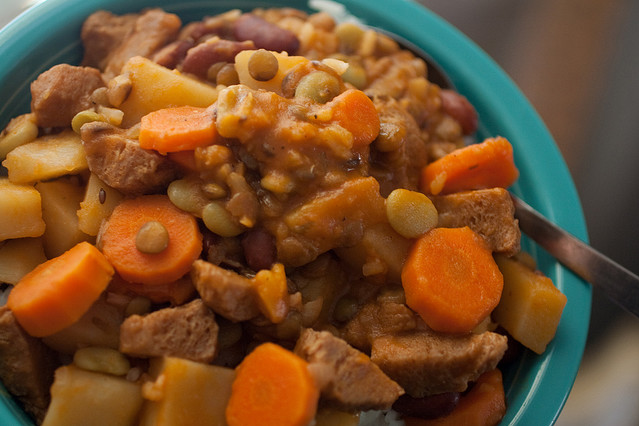 In addition to absorbing the taste and texture of regular meat, textured vegetable protein is far more economical. An average serving of TVP is less than a cheap cut of meat. Plus, hamburger is not pure beef, as extra fat is added to it. This is not the case with textured vegetable protein. When canned with oxygen absorbers and kept properly in a dry, room temperature location, TVP can have a shelf life of 5-7 years. After opening, it can be used for 6 months, and after rehydration it should be used at once or stored for no more than three days in the refrigerator. It’s usually rehydrated with warm water, but a bit of vinegar or lemon juice can be added as a preservative. So How Do You Use TVP? While backpacking or at home, textured vegetable protein can be used as a meat replacement, supplement, or extender. The extrusion technology changes the structure of the soy protein, resulting in a texture similar to meat. It can replace ground beef, ground lamb, and other meats. Using texturized vegetable protein, one can make vegetarian or vegan versions of traditionally meat dishes. It can also be added to gravy, eggs, put on pizzas and more. Unflavored TVP has a very mild flavor that readily absorbs the flavors of the foods it is mixed with. However, you can also buy textured vegetable protein in a wide range of flavors. The thought of using “soy meat” or “vegetable protein” is unappealing to some. However, you probably have already had TVP before. Most “bacon” bits you find in salads or potatoes are textured vegetable protein. It is also used in many fast food restaurants as a meat extender. If the label says something like “texturized soy flour,” if contains textured or texturized vegetable protein. 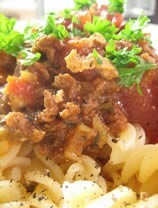 Because of its light weight and all the reasons listed above, many backpackers and hikers use textured vegetable protein as a meat substitute to make vegetarian or vegan versions of meat dishes such as chili, spaghetti, bolognese, sloppy joes, tacos, burgers, burritos, with eggs and more. Textured vegetable protein is a great option for backpacking, food storage, and even regular cooking. It is available at natural food stores, large supermarkets, and through online stores such as Wilderness Dining.